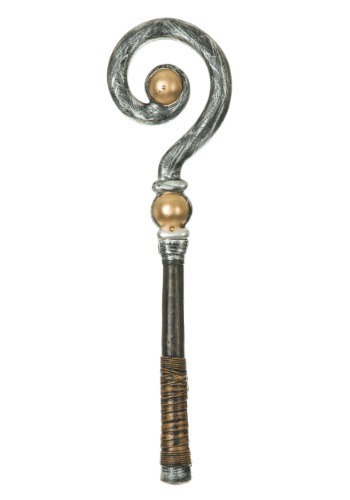 Check out this awesome Egyptian Crosier. It's one of the fanciest looking staffs around and it will be perfect for completing your Pharaoh or mummy costume. It will even go well with a shaman or sorcerer guise. Just don't expect to be able to transform this majestic rod into a serpent or alter any bodies of water with it. Although it looks enchanting enough to perform any number of magical feats we can assure you, we've tried everything. Besides looking absolutely amazing, there's not much more to this staff. However, it could be possible none of us here were truly worthy of wielding this crosier's full power. Maybe you're some sort of chosen one, meant to bring back they ways of ancient Egypt and rule with an iron fist. Well, there is only one way to find out! Get your hands on this accessory to complete your costume... and if you happen to unlock its mythical powers, just remember all your friends over here at halloweencostumes when you take over the world. We think a little bit of 1st class treatment is only fair for those who helped you reach the position of ultimate supreme leader.